Winmate is actively developing full series of rugged products from small-size handheld, middle pad, to mobile tablet PC in order to aim for various requirements of each niche market. 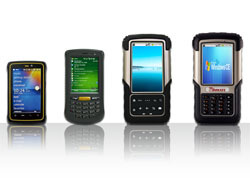 All of Winmate rugged product can support Wi-Fi and Bluetooth with optional 3G and GPS. Not behind the trend of compact smart PDA that has swept among consumers, Winmate is investing much R&D resource in industrial PDA. All of the series are not bigger than 5 inches so are easily portable and carried; with at least IP65 design, they are made especially for outdoor use. ARM-based system creates more operating system possibilities. Users can find fit OS like Windows Mobile, Windows CE, or Android as required. Most models can expand functions to build barcode reader or RFID inside. Size 3.5" 4.3" 5" 4.3" 3.7"
Industrial Rugged Pad series consists of 5.7”, 7”, 9.7”, and future 11.6”. It is relatively light and easily portable than Mobile Rugged Tablet PC series while its bigger screen size than Industrial PDA series can be used in more complicated applications. 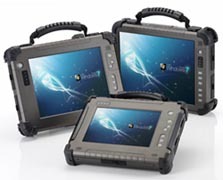 Mobile Rugged Tablet PC is the earliest in Winmate rugged product family. It includes 3 standard sizes: 8.4”, 10.4”, and 12.1”. Based on Intel CPU, in addition to current IA83 (Intel Atom platform) and I881 (Intel Core 2 Duo platform), Winmate is newly launching Intel newest dual core Cedar trail rugged tablet PC named ID80/ ID83 that own higher performance than single core series. Besides, CANBUS connector is available on 10.4” and 12.1” tablet. * Model name ended with CA means CANBUS solution.